Thanks to their passion for travel, nature, wildlife and fishing, Henk and Janine, young and adventurous South African nationals, found themselves, and each other on the shores of Lake Victoria in Tanzania. 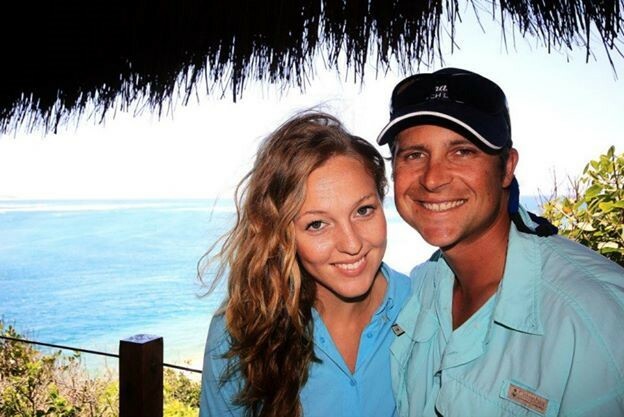 Eight years later, they are engaged to be married, and as the managers of Private Villa’s on Vamizi, they invite you to share the magical place that they call home. The last decade has been especially good to me. I have travelled, worked and fished on the South African and East African coastline as well as East Africa’s Islands. Sport fishing has always been a huge part of my life. My entire family has been involved in competitive fresh water angling for over 50 years and during this time nine Ferreira family members have represented South Africa on the national fishing team. It’s in the genes they say and I won my national colours at the age of 14 and represented South Africa on the national team for 8 years. Although, at this stage most of my experience was in fresh water angling, the ocean had a massive attraction for me and I recall as many as 6 visits a year to the action-packed, blue waters of Mozambique. After completing my senior year at school in 1998, I studied photography and completed my professional photographer’s course in 1999. Then, my love for the outdoors and fishing drew me back to the ocean and I decided to go to Northern Mozambique, where I embarked upon a career as a professional fishing guide. Starting at the bottom, I took a job as the first mate of an offshore fishing-charter boat. During this time I sharpened my salt water fishing skills and accumulated the necessary hours on the water to complete my Yacht Master course. Armed with the qualifications and experience, I tried out the “island lifestyle” and immediately fell in love with it. Working in remote areas taught me to be flexible and to put my hand to other areas than just my skillset. Over time I worked my way up into management positions and then proceeded to qualify myself as a manager in the hospitality industry. As one of a handful of people who can honestly call their work their passion I have travelled the world, fished in 9 different countries and finally, been privileged enough to put my roots down on this treasure of an island called Vamizi. Here I can manage something that is absolutely extraordinary and indulge in all my passions all the time. I was born and raised in the South African bushveld and, since I can remember, I have loved nature and the outdoors. I started working in the hospitality industry part-time at the age of 16 after school and over weekends as a means to make pocket money. When I was 19, I was offered a job to manage a small lodge in Tanzania and immediately leapt at the opportunity by jumping on the first available flight to Dar Es Salaam. Within 3 months I realised that this was the lifestyle for me—I was free to travel the world and meet new and interesting people on a daily basis. And so I gave up my life in South Africa and adjusted to the new mindset of becoming a ‘modern day gypsy’. One rainy Sunday afternoon a young man walked into the lodge where I was working and, little did I know, he would change my life even more drastically than it already had. His name was Henk Ferreira. Since then we have travelled together to 6 different African countries and have worked on numerous remote islands on the East coast of Africa. This took me completely out of my comfort zone. Suddenly I was taken out of the bush and thrust into the ocean and, because of my fishing-obsessed partner, I also needed to learn to catch fish in it! Having previously worked in the Quirimbas when the opportunity arose for us to return to this majestic part of the world it was an absolute no-brainer. We truly feel blessed and honoured to call Vamizi our new home and we look forward putting down roots on Vamizi and having a long and prosperous future with our new venture as Private Villa Managers.